"I have been a student of M&R for many years, though always in non-technical positions as a professional marketer for products and services companies in the industrial space. I realized whenever I studied Maintenance and Reliability Best Practices in preparation for the CMRP exam, that I was on the right track. Thank you for allowing me to successfully pass the exam as a result of your book on top of the nearly eight years I've been in the industry. I appreciate you very much. I just received notice that I passed the CMRP from The Society for Maintenance and Reliability Professionals! Thank you for the opportunity to learn from you and for your encouragement. I'm very proud to be a CMRP! Winner of first prize (Gold Award) in the RGVA book competition in Maintenance & Reliability at MARTS/Chicago in 2011. The first edition of the award-winning Maintenance and Reliability Best Practicesimmediately became one of the most widely read texts by maintenance, reliability, operations, and safety professionals. It is also being used at many colleges and universities throughout the world. 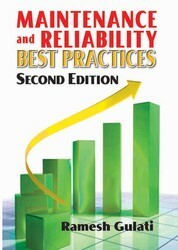 Maintenance and Reliability Best Practices, Second Edition has become a standard reference for anyone preparing for maintenance and reliability professional exams. In the time since original publication, this book has become a must-have guide and reference. It helps everyone ensure that their organization’s assets are operating as and when needed and at reasonable cost. Features a streamlined flow for easier study and reference. Includes self-assessment questions at the end of each chapter. One of the first books to discuss asset management related standards, including the new ‘ISO-55000 Asset Management Standards. Provides new material on corrosion control, risk management, and operator-driven reliability. A separate Workbook (ISBN 9780831134358) has been prepared with the assistance of Christopher Mears.